I remember trying an issue of the original Glory and not caring for it. When I saw that this revival had a different creative team and people said how good it was I gave it a try. I started reading it on a Friday night and only planned on reading an issue or two before going to bed. I ended up reading many more pages (close to half of this hardback collection) and finished it the next day. 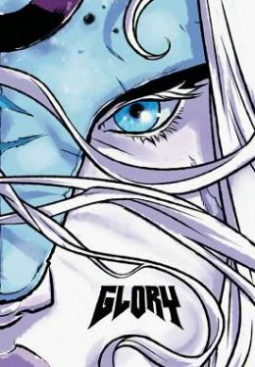 Glory is a trained warrior with a berserker rage. Her family seems doomed to battle in a millenia-old intergalactic war. She gathers her friends and tries to protect them but every time it seems like they have found peace, the war pulls her back in. The feel of the book is similar to Brian Azarello's "Wonder Woman". A warrior princess who is the top fighter, tries to get out of the family's influence, befriends Earth people, and keeps getting drawn back in. The execution and plots are different but fans of one should like the other. One main difference is that "Glory" is graphically violent. If you don't mind the violence, I highly recommend this graphic novel.